Collection Item 317: Adventures in Rocket City Lobby Card. 1942. What possible connection does a 1942 movie serial have to the Hawkins Strongbox histories? That is the riddle presented by Collection Item 317. Adventures in Rocket City was a fifteen chapter movie serial produced by Hyperion-Zephyr Productions and released during the summer of 1942. Discovered inside the Hawkins Strongbox was an original studio lobby card used to promote the picture and now archived as Collection Item 317. 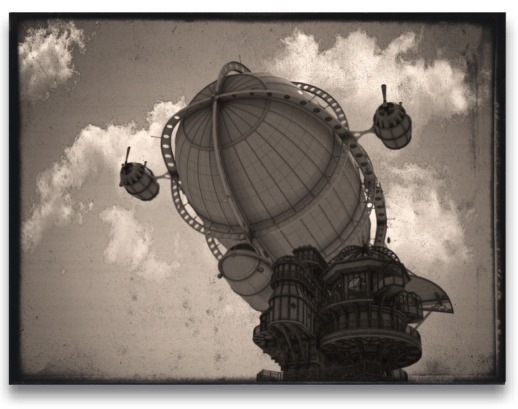 The item measures 11 in x 14 in and was printed in a sepia tone black and white. Hyperion-Zephyr Productions was a part of Hollywood's poverty row, a collection of studios that specialized in B pictures and movie serials. The studio emerged in late 1939, taking over the former Disney Studio location at 2719 Hyperion Avenue in the Silver Lake neighborhood just east of Hollywood. Walt Disney had moved his studio to Burbank earlier that year. Hyperion-Zephyr used that facility for soundstage production, while operating a backlot at the Timberjack Movie Ranch in the nearby San Fernando Valley. Despite its second-class status in the studio hierarchy, Hyperion-Zephyr earned a reputation for producing good looking films with impressive optical and special effects that belied their typically low budgets. 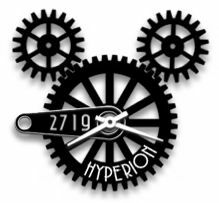 While most of the other poverty row studios focused on westerns and crime dramas, Hyperion-Zephyr specialized in science fiction and fantasy adventures. 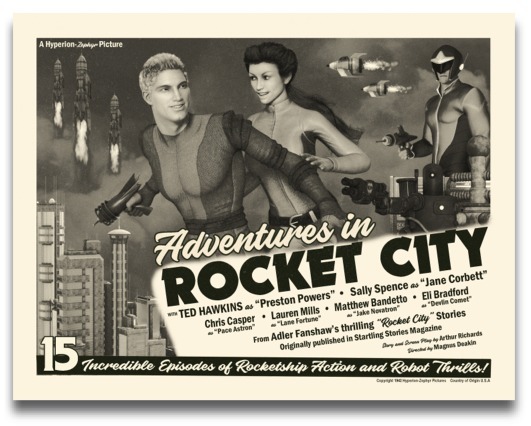 Adventures in Rocket City was one of the studio's more high profile endeavors and spawned two sequels, Revolt of the Rocket City Robots in 1944 and Rocket City Race to Jupiter in 1945. 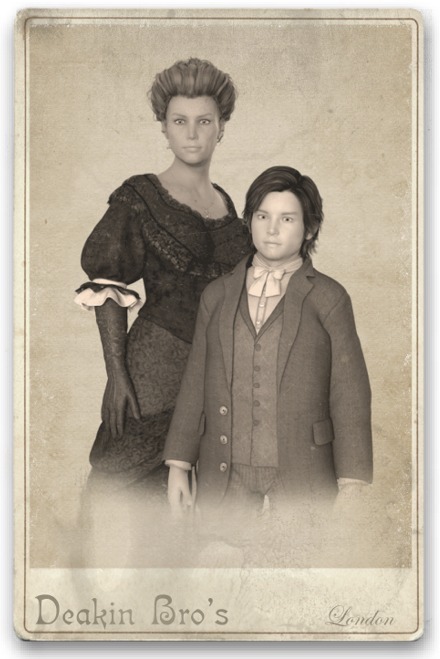 But what connects all of this to the Hawkins Strongbox and its storied cast of 19th century historical characters? An examination of the credits on the lobby card provides at least some answers. Adventures in Rocket City was inspired by a series of stories by Adler Fanshaw, published in the magazine Startling Stories between 1939 and 1942. As visitors here know, Fanshaw was a member of the Society of the Mechanical Sun. Following his retirement from newspaper work in 1925, he wrote novels and short stories until his death on 15 August 1953. Publicity Photo of Ted Hawkins. 1942. 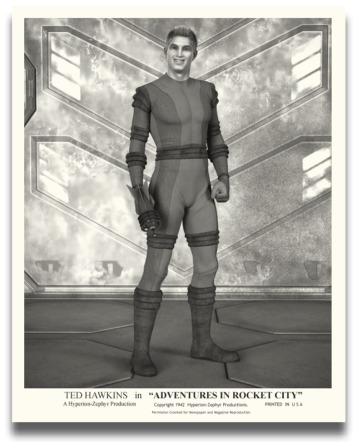 The serial starred Ted Hawkins as hero Preston Powers. Hawkins was born Theodore Victor Pepper on 20 October 1904 in Duquesne, Pennsylvania. He was the youngest son of parents Brent Hawkins Pepper and Orphelia Burby Pepper. His paternal grandfather was Geoffrey Hawkins. The film was directed by Magnus Deakin. 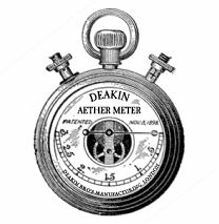 He was born in 1908 to parents Everett Deakin and Mary Ann Hughes Deakin. His paternal grandparents were Timothy Deakin and Falynne Hyperion Deakin. Magnus Deakin was one of four individuals who formed Hyperion-Zephyr Productions. 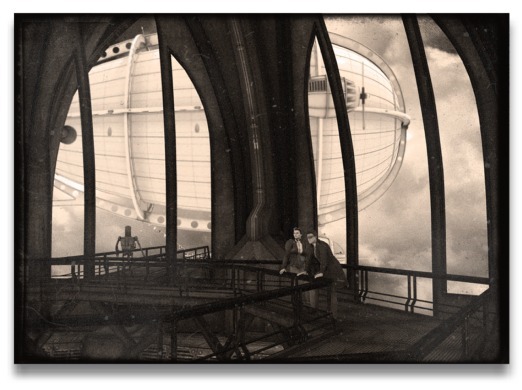 It would appear that the name of the studio was inspired in part by Falynne Hyperion's late 19th century airship fleet. Prior to the studio's inception, Magnus Deakin worked for Walt Disney Productions where he helped develop the multiplane camera and numerous other technical innovations. 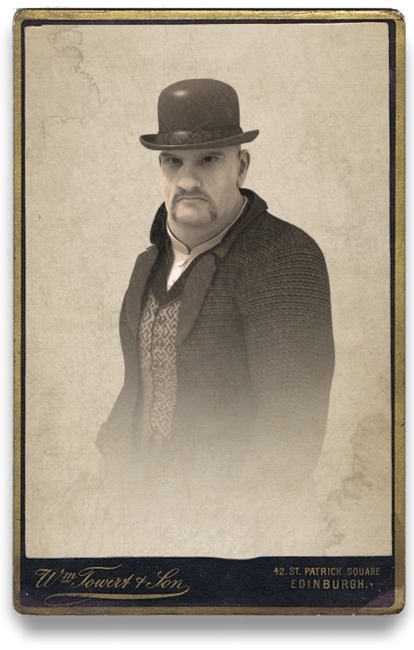 We have mentioned the name of Enoch Cyncad a number of times over the course of our online exhibition, but he has largely remained an enigmatic, albeit rather sinister player in the Hawkins Strongbox histories. 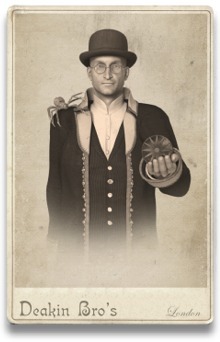 With the release of Collection Item 86, we hope to bring at least some clarity to this figure whose machinations led Geoffrey Hawkins and his associates to form the Society of the Mechanical Sun. Item 86 is a packet that was sent from London to the Kansas City office of the Vanderzee Detective Bureau in September of 1895. It contains a Scotland Yard circular, a cabinet card portrait, and a short handwritten note from Berkley Vanderzee to Geoffrey Hawkins. It appears to relate directly to Item 85: The Fitzgerald Envelope. Items 85 and 86 have been now designated as Lot 7: Hawkins in Kansas City. 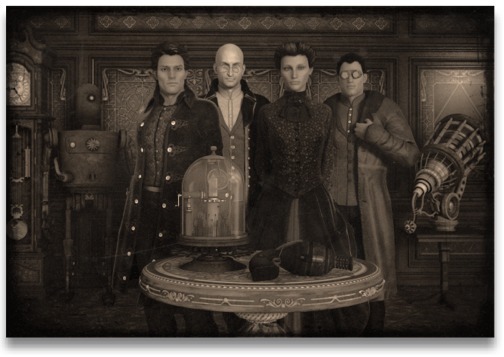 Researchers at the Victorian Mechanical Museum indicate that additional items in this lot are forthcoming. Item 86A: Handwritten note to Geoffrey Hawkins. Geoffrey,Your news was indeed distressing to us all. We thought that devil was returned to hell itself. We hope these prove helpful, despite the time that has passed. The studio in Edinburgh had retained negatives, fortunate for our purposes. As noted previously, the contents of the Fitzgerald Envelope indicated that Geoffrey Hawkins was in Kansas City, Missouri during the mid-1890s, apparently conducting an investigation into the whereabouts of Enoch Cyncad. It appears that Hawkins contacted Berkley Vanderzee in London to request identifying materials relating to Cyncad. Vanderzee in turn dispatched the packet that contained the circular and cabinet card. Item 86B: Scotland Yard Circular. October 1877. The Scotland Yard Circular (Item 86B) is dated eighteen years earlier. 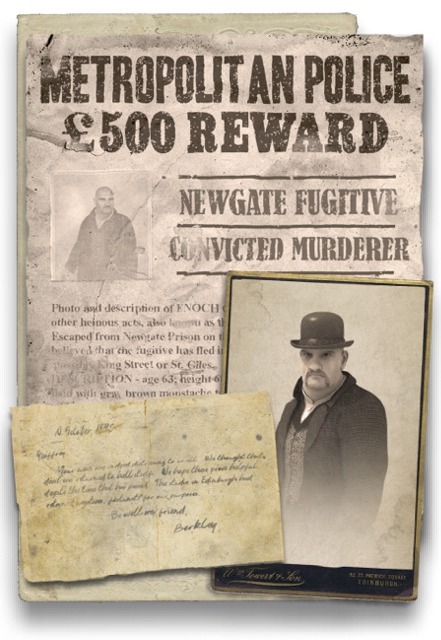 It advertises a £500 reward for information leading to the capture of Cyncad, described as a convicted murderer and escapee from the then infamous Newgate Prison. It refers to Cyncad as the Edinburgh Frankenstein and notes that the escape from Newgate took place on 21 October, 1877. 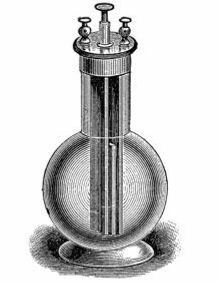 According to newspaper accounts from the summer of 1877, Cyncad, then a well known doctor and academic from the University of Edinburgh, was at the center of a London medical scandal that involved experimentation on live human subjects. The "heinous acts" noted in the circular purportedly focused on surgically implanting mechanical automata directly into the anatomy of kidnapped victims. Cyncad had enlisted members of the London criminal underworld to procure the necessary test subjects, typically from the city's poor and indigent population. His actions were exposed by one of his former students, Dr. Jeremiah Hawkins, older brother of Geoffrey Hawkins. Before being taken into custody, Cyncad violently murdered Jeremiah Hawkins. That act of revenge became the most prominent of the crimes for which Cyncad was ultimately convicted. His escape from Newgate took place mere hours before his scheduled execution by hanging. Item 86C: Cabinet Card of Enoch Cyncad. November 1876. 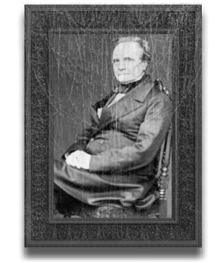 The Cabinet Card of Enoch Cyncad (Item 86C) was procured from the studio of Wm. Tower and Son in Edinburgh. A notation on the back of the card dates the studio sitting to November of 1876. The events of 1877 were only the beginning of what would become a decades-long plague of crime and horror initiated and perpetuated by Enoch Cyncad. He would give birth to the monstrous clock-heads, corrupt the science of ætherdynamics and rule a criminal underworld that would stretch from the old rookeries of London to the American frontier. Technical Drawing of Single Passenger Steam Walker. 16 July, 1889. 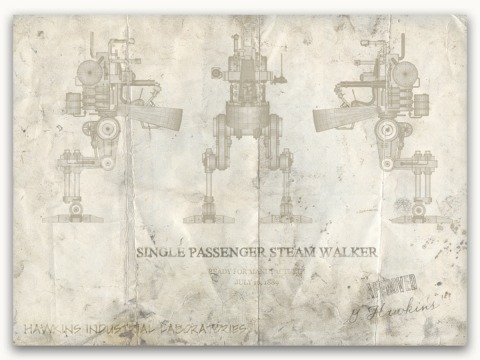 Collection Item 97 is an envelope containing pieces of ephemera that relate to one of Geoffrey Hawkins' more interesting inventions: the single passenger steam walker. The pieces consist of a technical drawing, a vintage photograph and a number of financial documents. For exhibit purposes, we are presenting the drawing and the photograph. Sometime in the late 1880s, the British government commissioned Hawkins Industrial Laboratories to design a steam-powered mechanical walker for potential military applications. In early 1889, Geoffrey Hawkins presented the Royal Engineers with a prototype design that was quickly rejected due to budget constraints. 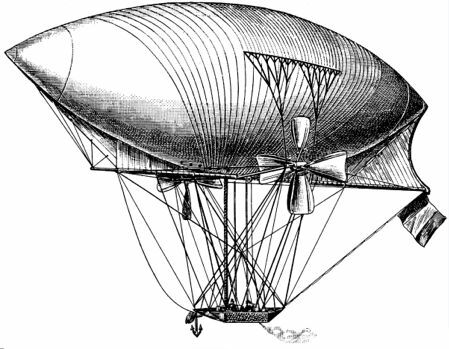 Hawkins decided to pursue the design independently, and on 16 July 1889, he approved manufacture of a prototype as noted on the technical drawing now displayed here. 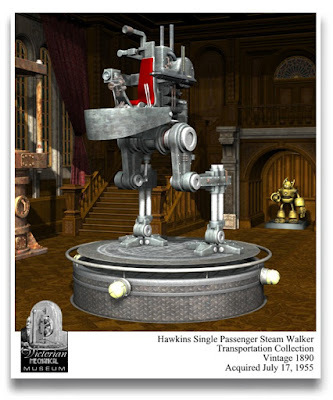 According to Devon Samuelson, Transportation Curator for the Victorian Mechanical Museum, ten steam walkers were manufactured in 1890. Six were purchased by the City and South London Railway company and used in construction of what was the first deep tube underground railway in the world. Two were sold to Nevada cattleman Giles Ainsworth and used on his Timberjack Ranch. Hawkins retained the last two at his Hawkins Industrial Laboratories in Faversham. Samuelson notes, "All six used in the C & SLR construction did not survive the project's completion and were likely sold for scrap. The two walkers retained at the Hawkins Industrial Laboratories were destroyed in the catastrophic fire of 1896." Photograph. Carson City, Nevada. 13 October, 1890. 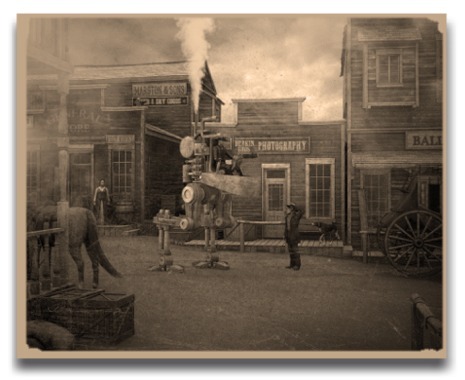 Hawkins personally delivered the component parts to Ainsworth in September of 1890 and supervised the construction of the steam walkers at the Timberjack Ranch. 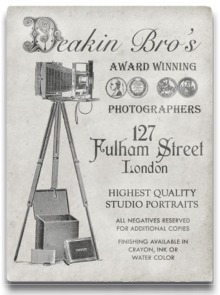 The photograph found in the Strongbox is dated 13 October 1890 and shows a steam walker in front of Deakin Bros Photography studio in nearby Carson City. File Photo courtesy of Victorian Mechanical Museum. 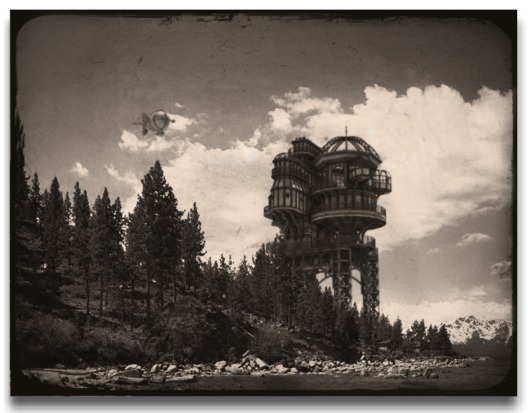 The Timberjack steam walkers have miraculously survived into the 21st century. One was donated to the Victorian Mechanical Museum where it was restored and placed on exhibition; the other remains in the possession of the Ainsworth family. 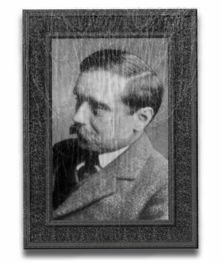 Cabinet Card of Jack Deakin. 29 September, 1883. The Cabinet Card of Jack Deakin is the first item we are exhibiting from Lot 15, often referred to by Mechanical Museum researchers as the Frontier Ephemera collection. It is part of a rather substantial number or artifacts dating from the latter half of the 19th century and originating in American West. It is cataloged as Item 157. Jack, the youngest of the three Deakin brothers, emigrated to America in early 1883. 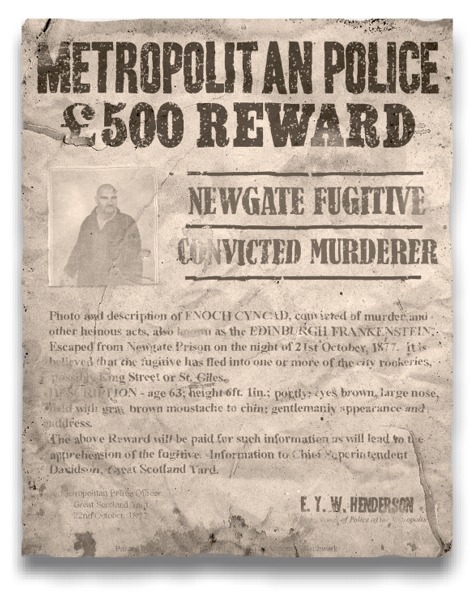 It is likely that he desired to leave London following the traumatic events relating to his 1882 kidnapping and imprisonment by criminal operatives of Dr. Enoch Cyncad. 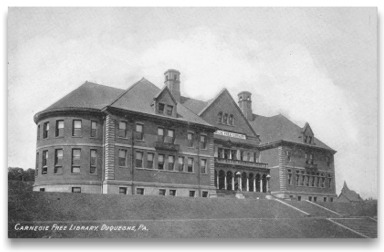 After arriving in America, he lived briefly in both Pittsburgh and Kansas City, before ultimately settling in Carson City, Nevada. 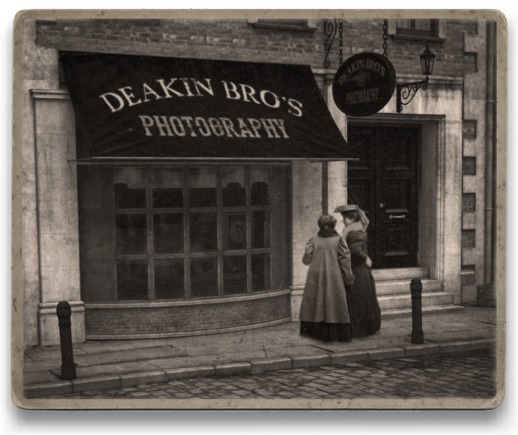 There he established a second Deakin Bro's photography studio with financial assistance provided by Nicholas Vanderzee and Giles Ainsworth. Nicholas Vanderzee, twin brother of Berkley, had served as Sheriff in both Carson City and nearby Washoe City in the late 1870s. 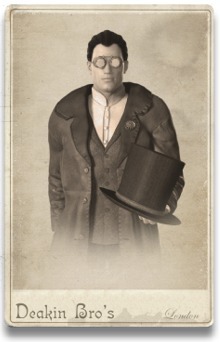 In 1883, he was in the early stages of creating the Vanderzee Detective Bureau. Ainsworth, maternal uncle to the Vanderzee brothers, was a prominent cattleman and owned the Timberjack Ranch, a massive 800 square mile spread located between Carson City and the eastern shore of Lake Tahoe. 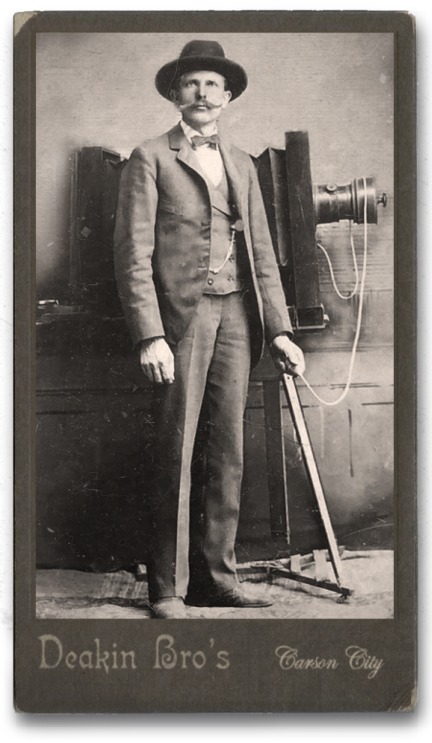 The Cabinet Card of Jack Deakin dates to 29 September, 1883. 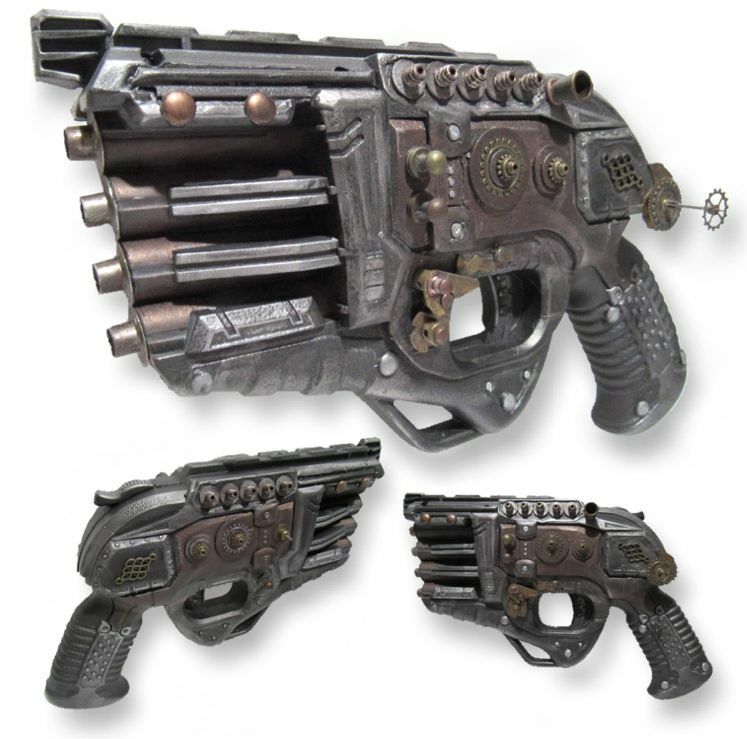 Item 55: Modified Saunders Æther V, aka Hell's Revolver. 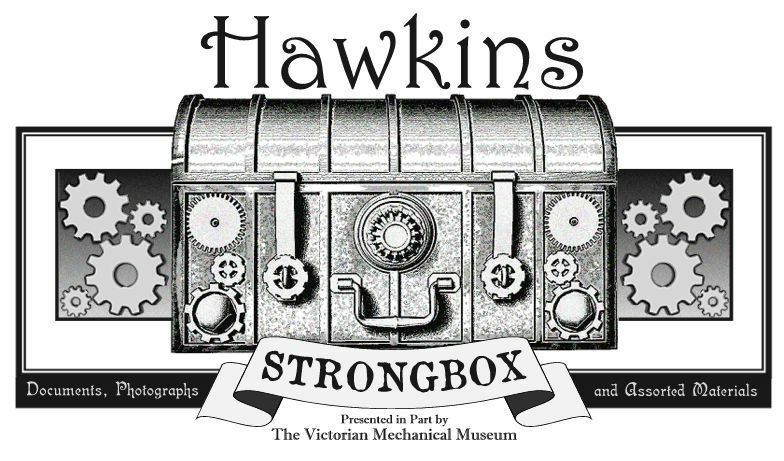 Collection Item 55 was discovered early in our Hawkins Strongbox explorations, but required careful handling and restoration before becoming available for exhibition at the Victorian Mechanical Museum and subsequently here at our online showcase. 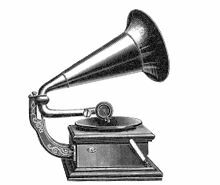 It was designated as Hell's Revolver by Museum researchers, the origin of said epithet to be explained later in this missive. The path to Item 55 originated in Lot 7, from which we have previously exhibited Collection Item 31: The Deakin Bro's Trade Card. 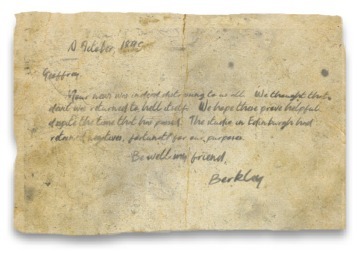 That group of items relates specifically to the 1882 disappearance of Jack Deakin and the efforts of his brother Timothy to find him and bring him home. According to a narrative recorded by Timothy Deakin in a small bound journal (Collection Item 29), Jack Deakin was taken prisoner by criminal underlings working for Dr. Enoch Cyncad. He had been searching for one of Cyncad's rumored subterranean outposts deep below the city of London. 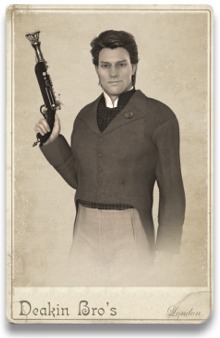 Timothy Deakin enlisted the aid of underground explorer Matthew Hardy and newspaper reporter Adler Fanshaw in locating and recovering his brother. After a heated battle with a number of Cyncad's clockhead automatons, the trio rescued Jack and managed a strategic retreat back to the relative safety of London's surface streets. In the process, they confiscated a firearm used by one of Cyncad's higher ranking subordinates. In his notes, Timothy Deakin identified the weapon as a heavily modified Saunders Æther V prototype, manufactured by Saunders and Sons in 1880. He observed ". . . that numerous ventilation ports had been added to reduce the combustibility risks," and "exterior mechanics were used to synchronise particle beam rotation through the multiple barrels." According to Devon Gillroy, Firearms Curator for the Victorian Mechanical Museum, Saunders and Sons abandoned the Æther V design in early 1881. 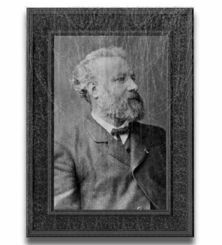 As noted here previously, Kenyon Saunders was tragically killed in 1882 while developing the company's Æther VI model. Gillroy notes there is evidence that Cyncad was just then beginning to tinker with æther-based weaponry. That tinkering apparently involved numerous flawed designs absconded from Saunders laboratories. The modified Æther V was likely one of Cyncad's earliest experiments. Timothy Deakin examined the piece extensively and concluded " . . . it is a thoroughly volatile and dangerous modification of an exceptionally flawed concept. " He added, "I hope to God Almighty that it is the only one of its kind." He then neutered it by removing its æther battery core and secured it in a lead-lined box within a second lead-lined box. At some later date it was placed within the Hawkins Strongbox. In July 1949, the pulp magazine Startling Stories published Adler Fanshaw's short story "The Battle Below," a thinly veiled albeit exaggerated fictional recounting of the rescue of Jack Deakin. At the story's climax, the heroes are confronted by an adversary who was "brandishing a revolver forged in the firey pits of hell itself." 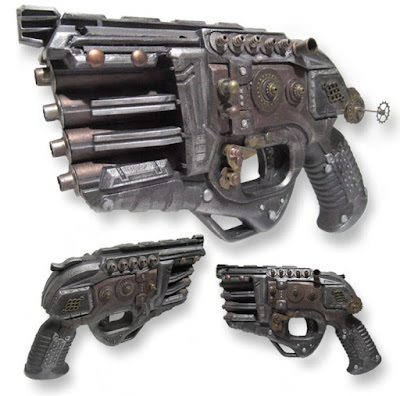 Museum researchers were inspired by Fanshaw's prose and Collection Item 55 became known as Hell's Revolver. After six long years of legal quagmire, the Hawkins Strongbox online exhibition is finally ready to resume operations. Due to court-imposed restrictions, we are not permitted to provide details of the litigations that effectively shut down our efforts in early 2011 and left our many readers confused and confounded. 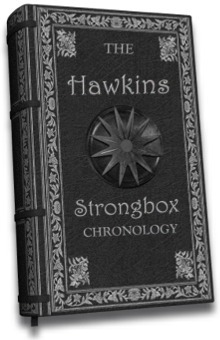 Rest assured, we continue to decipher, unlock and explore the contents of the ever mysterious Hawkins Strongbox. Item exhibits will be returning in the near future. As always, thank you for your interest and patronage.